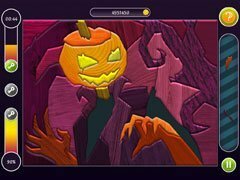 Halloween Patchwork Trick or Treat - puzzles in a frighteningly fun Halloween setting! Halloween Patchwork Trick or Treat has puzzles made of 6 different materials: wood, cloth, glass, paper, precious stones and metal. 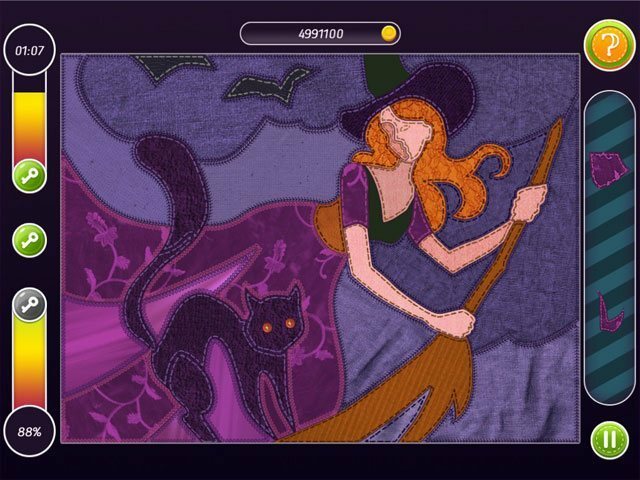 Piece together patchwork-style puzzles and guess the picture: Halloween characters, a haunted house, a monster in the bed, ghostly shadows, a sinister castle, a black cat, a Jack-o'-lantern, a headless horseman, zombies, vampires, witches, pumpkins and other nightmares. Boo! Don't be afraid, the ghosts' riddles aren't scary at all, but terrribly fun! 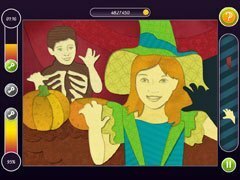 -Horrribly interesting gameplay for all ages! -Use bonuses and earn new ranks. Get as many keys as you can and unlock new worlds!